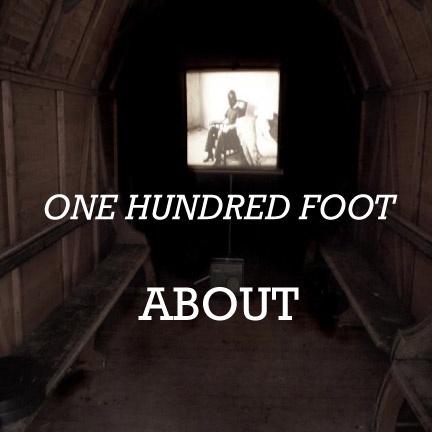 One Hundred Foot is the working concept for a new gathering of twenty filmmakers and artists 16mm films. As an industry standard, 100 feet of film (just under 3 minutes of time) is the given length for a small spool of 16mm film. This given/standard/restraint has been used by artists in the past and remains a pertinent form/format for creating films. Utilizing this number, a film can be conjured up within the parameters of two distant but specific points  0 and 100. In understanding that film, as opposed to digital, is measured in this tactile and physical form of length, the filmmaker/artist must address the issue of time through the measurement of a material length. For some, this constraint is seen as a time limit; for others, it becomes a finite amount of physical material in which to construct a work, similar to a sculptors material; and again, for others, their considerations may combine or reach beyond these deceptively simple approaches. The concerns around this issue are as idiosyncratic, subjective, and varied as the artists work itself - yet it is within this standardized and objective limit of 100 feet of film, that each maker must compose their subject matter through an exercise of economy. Whatever the filmmakers or artists intent, there is no doubt that this specific measurement is an actualized consideration for any artist working with film.